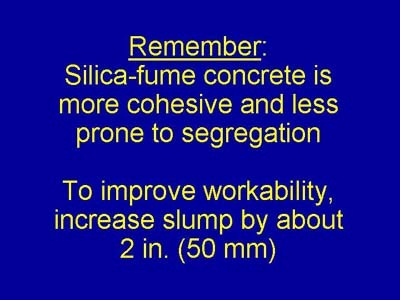 The ease of placing and finishing silica-fume concrete increases directly with slump. Because the concrete is cohesive and resistant to segregation, slump can be increased. Don't forget: slump increase must be achieved through the use of chemical admixtures rather than through the addition of water. The increase in slump should be coordinated between the contractor and the concrete supplier during initial discussions on concrete requirements.